The Wet Gold Technique is a simple way to estimate the percentage of gold in a gold alloy. This technique indirectly measures the density of the alloy. From the density of the alloy one can determine the percentage of gold using a formula similar to that in the Indium Solder Density Calculator. I explained how this technique works in a past post. Essentially, one weighs a sample of the gold alloy; let’s say it weighs 100 grams. One then weighs the sample as it is suspended in water (hence the term “Wet Gold”). This wet weight might be 94.1 grams. The sample will weigh less in the water because the water pushes up on it with a buoyancy force equal to the weight of the volume of water displaced. Dividing the difference between the dry and wet weights by the density of water, one gets the volume of the alloy. Since the weight (mass) of the alloy and volume are now known, the alloy’s density can be calculated. In the case above, the density would be 100/(100-94.1) = 16.95g/cm3. This approach requires the type of hanging scale that is used to measure the weight of fish. Let’s call this approach Wet Gold Technique I. A variant of this approach (Wet Gold Technique II) uses a lab-type scale. 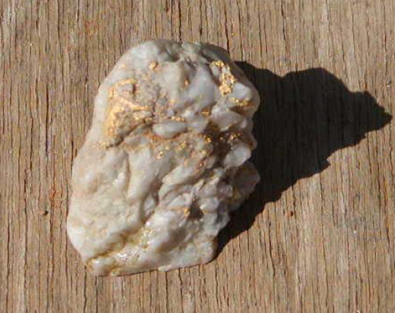 This second approach is often used in the field to measure the percentage of gold in gold silicate ores as seen in the photo below. Figure 1. The Wet Gold Technique II is often used in the field to measure the percentage of gold in gold silicate ores. It is important to note that the Wet Gold Technique can only work when you know the metal or mineral alloyed with the gold, and the techniques only work with one alloying metal or mineral. 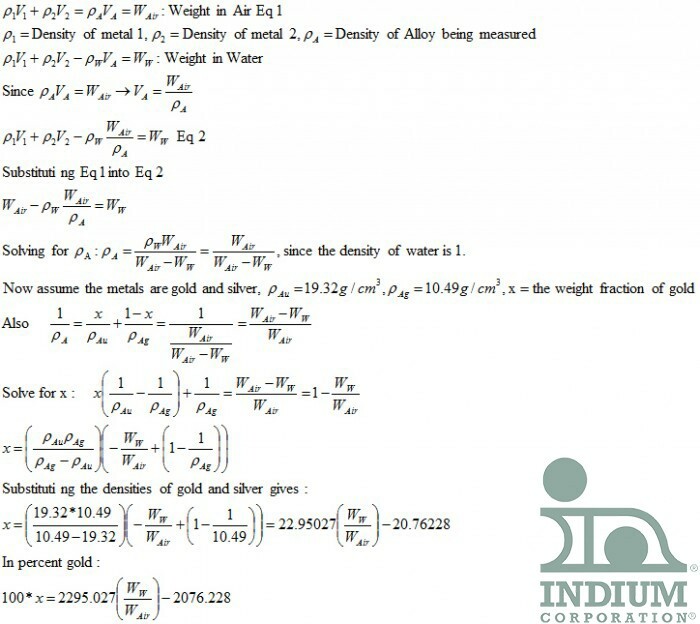 We use the following equation to calculate the percentage of gold in an alloy: Wet Weight/Dry Weight*2307.454 – 2088.136. Can you explain how it works? As mentioned, The Wet Gold Techniques only work for one alloying element. To derive the formula that Shawn uses, one needs to know what that element is. By trial and error, I determined that the alloying element was silver. I derived the equation as seen in Figure II. My result is close to what Shawn uses but is slightly more accurate than Shawn’s, likely due to rounding errors. Figure 2. The calculations to derive the Wet Gold equation for gold alloyed with silver. Equation 3 can we used with any alloying elements, but you must know the element’s density. You can develop an equation for a different alloying element by simply substituting the density of this alloying element instead of silver’s density in the equation 3 above. However, the overriding concern is that you know what the alloying element is, and that there is only one alloying element. As an example of the problems of not knowing the alloying element, consider this situation. You measure the density of the alloy as 12.2g/cm3 and assume the alloying element is copper. The equation Shawn used would tell you that the sample was 50% gold. However if the alloying element was really silver, the sample would only be 30% gold, a significant difference.